Is your next business convention just around the corner? Are you still clueless about the first step towards the trade show? Incorporating an impactful trade show booth design is critical in getting maximum attention of visitors to achieve your trade show goals. What business parameters to do you choose to objectively assess the effectiveness of a trade show booth design? How do you synchronize parameters such as your trade show goals, budget, marketing strategy and sales strategy with the choice of a trade show booth design? We take your questions and answer these here. In addition to this, we have provided some easy steps that you can follow to make the best choices for your trade show booth design for your next trade show participation. Planning for your trade show booth design sets the tone for your targeted marketing goals as it represents your brand identity on the floor of the event. You must make a list of your defined goals, such as raising on-site leads, announcing your brand presence, sales generation, brand promotions, and attracting maximum visitors to your booth, which enables you to choose the right booth design. Engage with your trade show service provider thoroughly to communicate all your requirements to achieve the ultimate objective of getting your desired booth design. It has been observed in most cases that almost 10% of the trade show budget gets exhausted in finalizing your trade show booth, excluding the amount that is being spent on choosing the right floor space. Follow the right methodology to reduce your stress related to overruling budget outlay. To start with, prioritize your demands related to the design in the consultation phase itself. Choose a design that portrays your brand philosophy in the finest way and strikes out the unnecessary additions that hold the possibilities of escalating the costs. Assess the durability and feasibility of your booth stand and the design part. Count the number of times it can be used and reused at various events across the years, and how much potential ROI could be extracted and once you are convinced with all the necessary touch points, you can make the investment. It is very crucial for your team to bring across your brand image clearly during the trade show event. Once visitors pay a visit to your booth, they must get a clear idea about your brand philosophy, at least on a cursory level. Fulfill this requirement by choosing a booth design that resonates well with your brand philosophy and displays your brand story in the best possible manner. It should be self-explanatory with your booth stand to depict the history, achievements, vision, commitment, and futuristic efforts of your brand without having the need of any of your marketing team members to convey the same. Integration of virtual reality tools can also smartly play a decisive role to narrate your brand philosophy before the visitors to zero down the gap with your prospects. Did you consider these issues before? Well, yes it should be that impactful to get access to the best possible business deals. Make a note that planning for your tradeshow booth design is not a one-day business. It requires days, weeks and sometimes months to come to a common ground with your trade show service provider with regard to choosing your booth strategy. Start your planning at least six months before the event to eliminate the glitches in the planning stages. Start with a proper analysis of the interests and demands of your targeted visitors that enables your team to shape a raw outline for your booth design. Understand the local audience where the trade show is going to be held, and the language that is being commonly used that enables you to incorporate better and impactful content in your booth. Your future prospects would not prefer to wait in long lines to get introduced to your brand offerings that are portrayed in an unorganized manner. With regular observation, it has been noticed that custom trade show booths convey your brand philosophy to the visitors in a much clear way in comparison to a pre-conceived design. While choosing a design, consider paying equal attention to having adequate booth space to easily accommodate your marketing team and visitors. Concentrate on creating bigger and better enter and exit route for your visitors to increase your trade show audience attendance. Plan for a dedicated seating area to hold meetings and other quick discussions to increase the traffic. You can also choose to get a personalized conference to hold highly confidential business meetings as well. A trend has been observed in the trade show business where it has been seen that open layouts preferably attracts the audiences as it is accessible from any corner to your trade show visitors. On the other hand, if you are planning to rent a small booth stand, make sure to get an archway or an overhead hanging structure to give an impression of a larger booth to visitors. Graphics, unarguably, play the most important role in formulating a trade show booth design. Integrating the right graphics differentiates your booth from your competitors and increase the chances of getting high volumes of traffic on the floor of the event. Use of neutral or dull colors makes your booth common and disinteresting, leading the audience to ignore your booth and walk past it right away. To catch the attention of visitors in the first instance, choose a color scheme that matches your brand image and is vibrant at the same time. Lighting also plays a big role in enhancing the advocacy of your booth design presentation. Use lighting in unique and creative ways to highlight your key brand differentiators and any upcoming product or promotional material to generate a great sense of interest in your trade show audience. There are other important areas in your trade show booth design that require a similar level of concentration. In a trade show booth, flooring creates an appealing and inviting sense amongst the visitors and enhance the visiting experience. An efficient booth floor plan makes it a comfortable experience for your team and visitors while they stand and discuss for a longer period of time. Custom flooring that is well-matched with the graphic design of your booth works really well to enhance the overall display quality of your booth design. Immersive technologies such as visual enhancements, audio systems, mobile charging stations, touch screens, and other multimedia devices can be incorporated in your booth design to sustain the attention of your visitors. It enables them to connect better with your brand offerings that subsequently leads to better chances of developing your business opportunities. Collaborate with your trade show service provider and confide in them about your ideas and strategies related to integrating any in-booth media devices. Assessment of your requirements requires you to fill up a form listing all your booth raw requirements related to your booth design. This information enables your service provider to get all the important and valuable insights required to build your booth stand. Refining raw ideas mandate collaboration with your trade show service provider that provides you with a raw design outline to make the relevant modifications and changes. Once done, you will be taken through a 3D journey of your booth design to get a better and precise idea. At the stage of execution of your booth structure, your designs are being sent for development by your service provider. Great level of concentration is drawn at every point with your valuable suggestions at every step. Your service provider showcases the final structure before your team for final approval prior to the trade show event. Once you give a green signal, you are ready to demonstrate your brand philosophy with your own customized trade show booth design. Invest considerable time to choose the right partner for the execution of your trade show booth design. It can even take months to find the right service provider. With well-put research, you can find the best ones rather quickly. Speak about your booth design requirements unambiguously with a potential partner and if you find that all your expectation is being met, simply move forward with finalizing your choice. You can also measure the expertise of any trade show service provider by its experience in the particular field of work. Thus, choose the right partner for streamlining your trade show booth design and get the best business outcomes with your trade show participation. 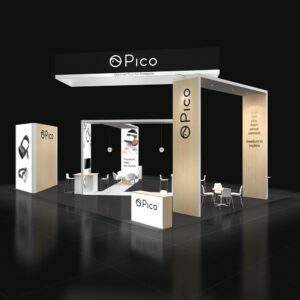 By following these steps and measures, we are sure that your team would get the best kind of support to get your trade show booth design concept right and achieve maximum marketing benefits with your trade show participation. Remember that scaling success with your booth design is not about the aesthetics only. There are diverse components of business value attached to your choice of booth design. These components affect your performance at a trade show. Your job as a trade show participant is, to begin with, a defined template of your requirements based on the value proposition that your brand merits and your marketing team want from the trade show booth rental service provider.